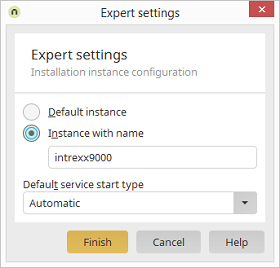 Setup Welcome dialog Installation packages / Click on "Next" Select/enter installtion path / Click on "Finish" Installation summary / Click on "Expert settings"
With this option, the current installation will be used as the default instance. You can enter a name for the current installation instance which allows you to distinguish it from other installations. This function enables parallel installations of Intrexx. Please read our notes on parallel installations.